“When I engage in dialogue, I recognize that those I speak with are equal to me, and I work from the assumption that they hold within them wisdom, knowledge, ideas, and gifts.” That line from Jim Knight’s book Unmistakable Impact highlights the power of dialogue as a vehicle to learn from the people around us. The act of telling or explaining what they know cements students’ understanding of concepts. Conversely, struggling students benefit from hearing their peers’ ideas, opinions, and explanations. Even the opportunity to ask questions can help students to begin to deconstruct challenging ideas or concepts. I wholeheartedly believe that the potential of the group far exceeds the intellect of any one individual in the classroom–myself included. Despite my passionate belief that discussions are an integral part of the learning process, early in my teaching career I failed at generating successful equitable discussions in class. I asked follow up questions, used “wait time” and employed a variety of other strategies designed to lure students into discussion, but the same five kids dominated discussions and everyone else remained silent. There are a variety of impediments to real-time discussions that result in excluding a majority of students from participating. This lack of equity in real-time discussions creates an imbalance that can be corrected when discussions take place asynchronously online. This asynchronous environment provides something in-class discussion can’t: time. For the last three years, I’ve used Schoology’s robust discussion functionality to facilitate online discussions to complement our in-class conversations. This online space gives every single student the opportunity to engage in our class dialogue. Wassermann identifies a key conflict in the classroom: the race against the clock to cover curriculum versus the desire to give students a voice in class discussions. She accurately depicts the frustration many teachers face when attempting to incorporate dynamic discussions into their classrooms. When teachers introduce an online avenue where students are able to express their thoughts outside the time crunch of a normal school day, all students can have a voice in the class. This equity of voice fosters relationship building, increases participation and encourages deeper engagement. 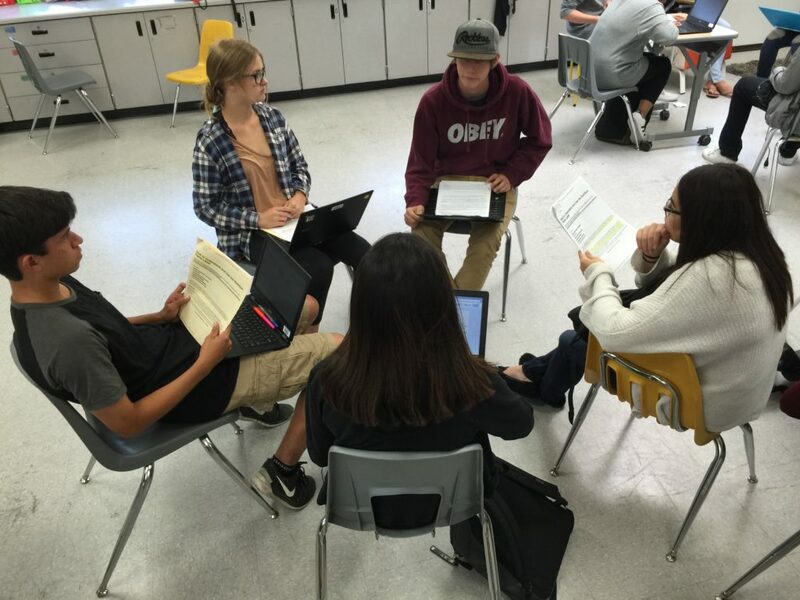 For those teachers who are frustrated with the quality of in-class discussions, I’d encourage you to explore how blending asynchronous online discussions with small group in-class conversations can lead to more powerful students interactions and deeper learning. My first book, Blended Learning in Grades 4-12, provides concrete resources for creating a safe space online, building an online community, designing dynamic discussion questions, and supporting students in saying something substantial online. Thank you for this post. My school uses Google Classroom and I am wondering if Google Classroom can be used to facilitate online discussions. I will be trying this for the first time this semester. Any additional tips for a first timer? I am thinking about using on line discussions to facilitate additional discussions about their Literature Circle book(s). You can definitely use Google Classroom to facilitate discussions about their individual literature circle books. I’d suggest you create an assignment in Google Classroom for each book group and they can post their discussion comments below the assignment directions. It isn’t the most robust discussion functionality, but it works. Here is a link to a blog that shares 3 strategies for using Google Classroom for discussion. Yes! We are lucky enough to have Schoology as well, and I do find this technique to be unsurpassed for bringing normally quiet voices into classroom discussion. Sometimes I will hold an ongoing discussion throughout a couple of classes. I have students post as their opening activity, then respond as their closing activity at the end of the class. I’ll have them respond again at the start of the next class and respond again to add new information at the close of the next class. One tip I’ve found very helpful in helping students make effective posts is requiring them to end their first post with an original, open-ended question for the whole class. This means I had to give a quick lesson on what constitutes an open-ended question, but it makes it much easier for students to respond when the initial post ends with an open-ended question. Also, if they do participate in live small group discussions during class, the groups can generate questions and post them in the online discussion for further contemplation. Thank you for sharing your experience and strategies, Molleen! I also have my kids end their posts with what I call an “exit strategy” that invites peers to answer a question, share a connection, reach a different conclusion, etc. It definitely improves the quality of replies to peers! Before I had technology, I would use a class list or seating chart to check off the names of each student as they participated. For students who had not participated during the beginning of the period, I would specifically call on each to give their thoughts or opinions. For some students I might ask them to elaborate on their statements by giving examples or more comments. For the student who had a lot to say, I might ask that particular student, “Please let other students comment who hadn’t said anything yet. If we have time left in class after everyone has commented, then you can continue your comments.” Absent or missing students are called on when they return. First, other students review what was discussed when they we absent. I think this is an excellent way to keep students engaged, motivated, and on task. Thanks for such a great content! My school uses Google Classroom and I am wondering if Google Classroom can be used to facilitate online discussions. I will be trying this for the first time this semester. Any additional tips for a first timer? You can definitely use Google Classroom for online discussions, but the functionality is really a simple threaded conversation. I use Schoology because I want my students to be able to reply to one another’s posts and engage with each other in a more dynamic way. I use Google Classroom to disseminate and collect assignment, post announcements, etc. but it is not my choice for online discussions. Hopefully, this is an area of Google Classroom that will develop over time. Approaches intended to lure scholars into conversation, but the similar kids dominated deliberations and everybody else continued soundless.